This picture of Serov V. A. shows two female figures who came to the shore of a small river to wash dirty laundry. Washing and maintaining cleanliness in the house has always been women’s responsibilities, so we see how with a cold, winter day, it is women who rinse clothes in icy water. They kneel, bent low over the water. Women are very warmly dressed – they wear a winter sheepskin coat, boots, and a scarf. On the right is the washed laundry, which is waiting for its turn. In the foreground we see a fast-flowing river. Traditionally, washing in Russian villages began in early spring, when the first streams were thawed. 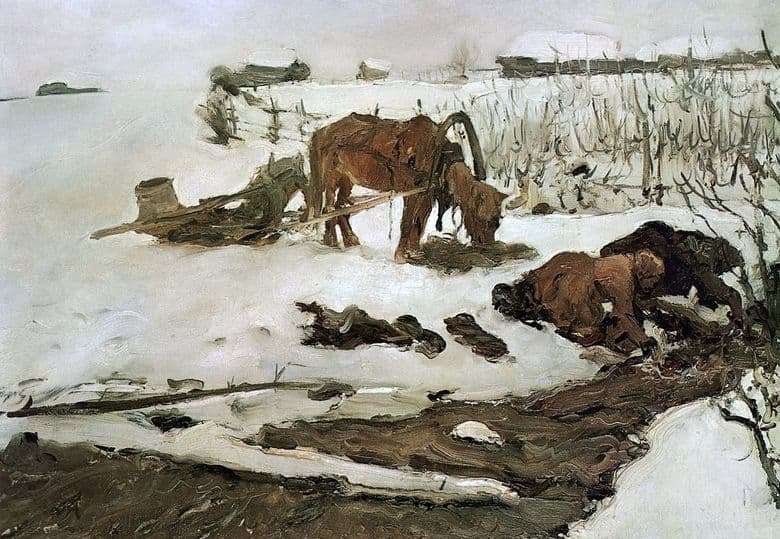 With the help of sharp strokes, Serov managed to convey the flow of the river, because standing water is not suitable for thoroughly rinsing linen. In the lower left corner is a log that fell across the river, almost forming a bridge. The river, apparently, is not deep, so people do not use special buildings for washing, but do work right on the very shore of the reservoir, without fear of falling into the water. Immediately after the women is a horse. This is not a quick, high-spirited horse, but rather a nag, tired of the difficult rural life. The horse is a little hunchbacked, short, more like a pony. She obediently awaits her mistresses, and at this time she is eating hay poured over her. Behind the horse are the sleighs, on which the women came to the river. The image of a horse is simple and understandable to every person – this animal is a loyal assistant of a peasant, therefore its figure fits well into the Russian rural landscape. The background is almost empty, it does not distract and does not attract attention to itself – only a few houses from the nearby village can be seen. Such a statement of the figures in the picture emphasizes that the most important action takes place in the foreground. The artist mainly used only three colors: white, black, brown.